Freeways are clogged. Terror stalks our cities. At shops and restaurants, the customer is seldom right. Pressures of big-city life can anger anyone. But Bill Foster is more than angry. Hes out to get even. Foster abandons his gridlocked car license plate D-FENS on the hottest day of the year and walks straight into an urban nightmare both absurdly funny and shatteringly violent. Academy Award winner Michael Douglas is Foster, an ordinary guy at war with the frustrations of daily life. 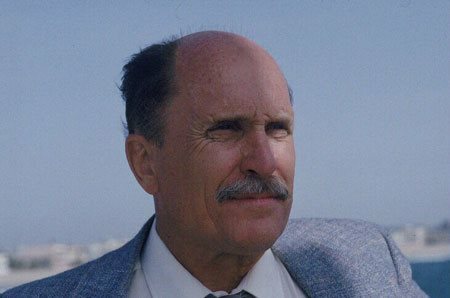 Fellow Oscar winner Robert Duvall is the savvy cop obsessed with stopping Fosters citywide rampage. This spellbinding thriller is their story, asking? Are we falling apart? 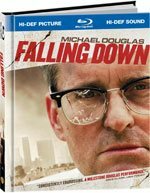 Download Falling Down in Digital HD from the iTunes store. Falling Down images are © Warner Bros.. All Rights Reserved. Have you ever had a bad day? 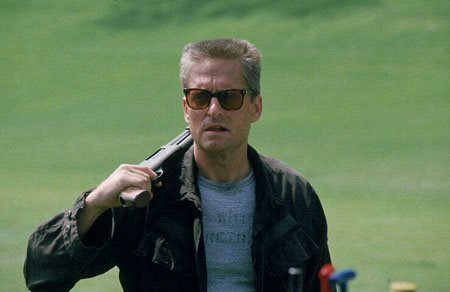 Bill Foster (Michael Douglas), a laid off government defense worker, is about to embark on one of his worst. Just wanting to "Go Home" Foster (Identified by his 'D-FENS' license plate) has had enough of the daily grind and the audience is first introduced to a character who clearly has some issues. Every little thing around Foster as he sits stuck in L.A. traffic begins to agitate him. The smiling 'Garfield' stick up on the car next to him, the nuances of the flashing "delay" signal in front of him, the 'Jesus Saves' bumper sticker suddenly all mix together into more than Foster can handle. It all quickly mixes into a toxic mental breakdown for Foster who leaves his immobile vehicle, exclaiming to other frustrated motorists that he really just wants to "Go Home!" Home life doesn't seem like the best place for Foster. Its his daughters birthday but we learn that his ex-wife has taken a restraining order out against him. Each time that Foster calls home to check up on family, he is greeted with a less than accepting invitation to return home, and with each call his mental state breaks down even further. In his mid guided attempt to reach his daughters birthday party on foot from downtown Los Angeles to Venice Beach, Foster begins to grow more and more violent, acquiring various weapons to thwart any "adversary" that stands in his way. A Korean convenience store clerk, a few gang members, the patrons of a fast food joint and even some elderly retirees on a golf course all face Fosters wrath. It is clear that nothing is going to stand in the way of Foster seeking his happiness for the way things used to be, except maybe himself. A retiring cop (Rober Duvall) begins to piece together the string of violence that Foster leaves in his wake and before long he is hot in pursuit of the madman who doesn't realize his behavior is causes havoc throughout the city. When Foster finally reaches his family, he has to face down the savvy cop and answer the ultimate question: is he falling down, or are we. Douglas gives a convincing performance as an ordinary fellow who one day just snaps. Cracking a smile only at the site of a giant explosion (which he of course causes) the depression and mental anguish the character is going through is evident on Douglas' face and with his horn rimmed glasses and flat top haircut he looks the role of everyday engineer turn psychopath perfectly. The rest of the cast is decent with Duvall portraying the character that grows the most in the film, going from his last day on the job, disagreeing with his superiors, to the hero of the day for finally confronting the madman on the loose. Both characters have changed by the end of the film and the portrayal of each side of the coin is solid. The special edition Blu-ray features commentary by Michael Douglas and director Joel Schumacher. 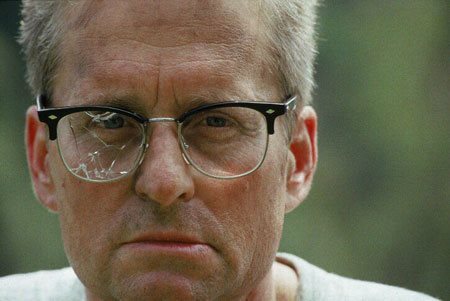 A conversation with Michael Douglas in which he delves more into the motivations of the Foster Character and the theatrical trailer. Douglas says: "I saw this project being about the loss of our middle class, and I had the opportunity to play a character who sort of believed in working hard and getting results but his world changed and he couldn't make sense of it anymore. Observing what is going on in our country, I see people continually struggling with these same issues. They're trying to find a new path that's not extreme, but lets them survive and prosper." A special booklet is included which details the cast, including their past films and achievements, and gets the reader deeper into the plot and psychological makeup of Ben Foster. The book also details how the filmmakers portray the city of Los Angeles today, almost making it a character in the movie itself. One that is living, breathing, and like our main character, Falling Down. It is a welcome addition to the Blu-ray package and something no fan of the film should be without. Not without its flaws, the movie moves at a brisk pace and the viewer is left on the edge of their seat wondering what Ben Foster is going to do next and is consistently shocked at what he is capable of. While not much is known about his past besides brief videotape footage of his love for daughter and loving contempt for his wife, it is clear Fosters present is mired in deep psychological issues and a violent streak caused by his deteriorating surroundings. A satirical look and contemporary culture and how one man can loose his way, the film seeks to answer the question "Are we falling apart?" and if so who will be there to catch us when we fall. For Ben Foster the answer is not as simple as just giving up, in contrast he is simply "Falling Down." 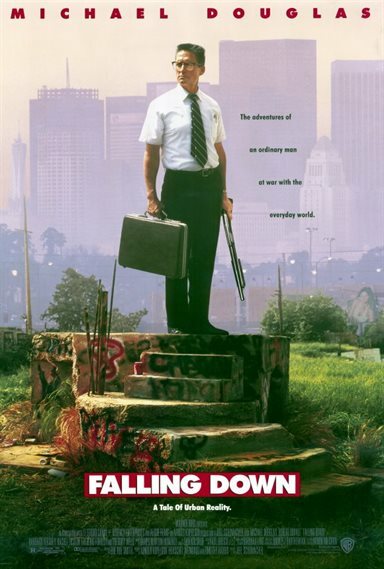 Falling Down images © Warner Bros.. All Rights Reserved.